The name derives from the word "coin" (corner) for its particular shape. One of the largest municipalities in the Val d'Aosta, in the southern part of the region at the foot of the Gran Paradiso massif, near the Meadows Sant'Orso (a wide plain covered homogeneously by a thick green lawn). The U-shaped valley of Cogne is eroded by streams fed by melting snow and the lakes located at high altitudes, branch towards East through the valleys of Urtier and Valleille; towards South through Valnontey; towards North through the Valley of Grausonth, whose rivers converge in the Dora Baltea. The town is surrounded by forests of pine, larch and fir trees, framed by the mountains in the background by rocks and glaciers and colored by rhododendron, juniper, blueberries and alders. The fauna is diverse and many species are protected by the Park. The town was famous for its rich deposits of iron that permitted the production of the steel of Aosta, whilst today, it is famous for handmade lace. The resort offers more than 80 kilometers of cross country ski trails, 9 km for the Alpine ski tracks, as well as rock climbing, fully equipped shelters at high quotes, a dense network of trails for paths for hiking and mountain biking in the Summer, fishing, kayaking and other sports. According to ancient legends, the first inhabitants of Cogne came from Valsoana. At first they settled in the valley of Urtier, where they built a church, then they moved into the central valley. 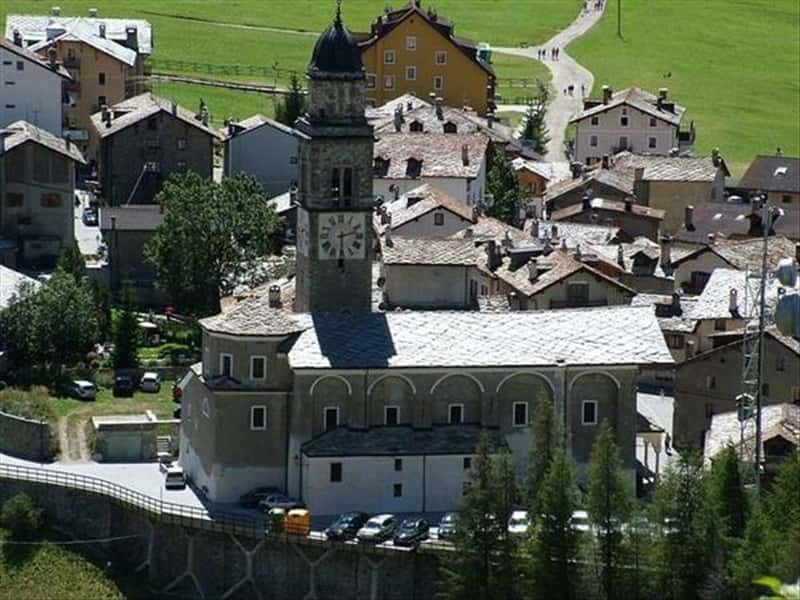 Even today, in common with the people of Valsoana, Cogne dedicates its cult to San Besso, martyr of Thebes. It was conquered by the Romans, as evidenced by important finds, which are still well preserved. In the XI century the town belonged to the jurisdiction of the bishops of Aosta, who started the building of a castle, the current Royal Castle. In the XVIII century it became a town with its own authorities. In 1630 struck by a terrible plague, the population halved. Since 1741 it was ceded to the Savoy. The Parish Church of St. Ursula, the first church, built in 1202 in Crete at 2020 meters. Restored and enlarged in the XVII century, it features a single nave with a rectangular plan and an octagonal dome and a Bell tower, that dates back to 1828. Inside it preserves a wooden altar in Baroque style, an organ rebuilt in 1772 after a century and enlarged in 1969. In the past, on the porch in front of the entrance of the church, various pre-marriage rituals took place, including the teaching of catechesis. The Castle of Aymavilles with four crenellated towers, which was built in the late XII century by the nobles Challant of Fénis and transformed in 1713 into a residence. The Roman bridge, Pont d'Ael, built in the III century B.C. by two Roman settlers, Aimo and Avila, over the torrent Grand Eyvia. It is a magnificent work of engineering, a high aqueduct bridge approximately 82 meters long and over 50, in perfect condition. The Museum "Maison de Cogne" entitled to Gèrard Dayne. The permanent exhibition of handmade pillow lace. The Atelier of Arts et Metiers which features a rediscovery of the ancient local traditions and customs. This town web page has been visited 18,745 times.